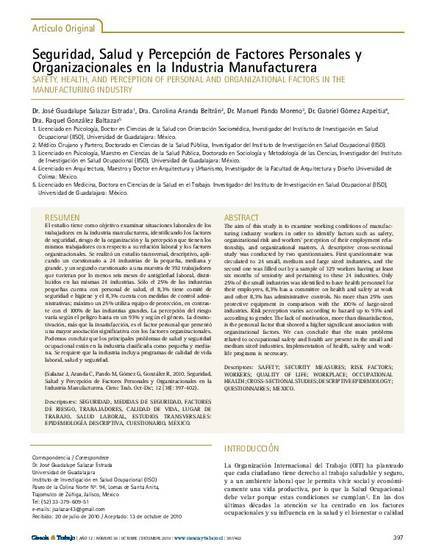 The aim of this study is to examine working conditions of manufacturing industry workers in order to identify factors such as safety, organizational risk and workers’ perception of their employment relationship, and organizational matters. A descriptive cross-sectional study was conducted by two questionnaires. First questionnaire was circulated to 24 small, medium and large sized industries, and the second one was filled out by a sample of 329 workers having at least six months of seniority and pertaining to these 24 industries. Only 25% of the small industries was identified to have health personnel for their employees. 8,3% has a committee on health and safety at work and other 8,3% has administrative controls. No more than 25% uses protective equipment in comparison with the 100% of large-sized industries. Risk perception varies according to hazard up to 93% and according to gender. The lack of motivation, more than dissatisfaction, is the personal factor that showed a higher significant association with organizational factors. We can conclude that the main problems related to occupational safety and health are present in the small and medium sized industries. Implementation of health, safety and worklife programs is necessary.